This installment continues the ongoing series on Batangas History based on the 1998 narrative written by Ceferino Capuchino1. Readers who might have missed the six previous installments may find these archived under the Community History section of the main menu at the top of this page. In the previous installment, we talked about Capuchino’s description of Mataasnakahoy from the early seventies to the eighties, culminating in the Jubilee year of 1982 and the subsequent and unfortunate demise of Mayor Florencio Landicho. The remainder of his term was seen out by then Vice-Mayor Isagani Laluna. Capuchino described Laluna’s take-over of the office of the mayor as makisig na pamumuno, his use of the word makisig probably meaning smooth. He was, Capuchino added, a lawyer who had graduated from the Ateneo de Manila. During his short tenure, he had the municipal hall modernized. He did not, however, run for mayor in the next elections but, instead, accepted a post with the Bureau of Customs. In 1984, Capuchino continued, elected as mayor was Celso A. Landicho, son of the former mayor Jose M. Landicho. Prior to his election, the younger Landicho was already an elected councilor of the town. As mayor, he would be reelected twice and serve in this capacity all the way to 1995. 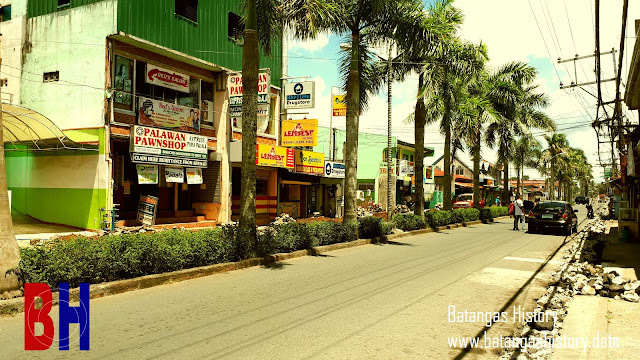 It was during his term that roads all the way to barrio Nangkaan as well as those inside the poblacion or town center were paved with concrete. He was something of a protégé, Capuchino wrote, of Representative Lally Laurel Trinidad of the 3rd District of Batangas, daughter of the former Speaker of the House of Representatives Jose B. Laurel Jr.2. Landicho’s first Vice-Mayor was Mateo Magpantay. The next was Eduardo Reyes, a retired public school teacher. Both were admirable gentlemen, Capuchino wrote, who helped to steer the town along the path to progress. Capuchino passed up the opportunity to document developments during Landicho’s three terms as Mayor and, instead, preferred to write down the personalities involved in public service at the time. Apart from the confusing roster of personalities who supposedly became Vice-Mayor, he also named as having been the town’s Councilors during this time Juan Magpantay, Angel Dimaunahan, Julian Solis, Lucio Reyes, Sixto Biscocho, Alejandro Morada, Lorenzo Maranan, Jose Matanguihan, Marianito de Torres, Berting Cuevas, Emilio Lubi, Juan Hernandez, Mateo Magpantay (earlier named as having been Vice-Mayor), Rafael Silva, Apolinario Tamayo, Dominador Castro, Teodulo Biscocho, Exequiel Recinto, Perfecto Loleng, Valentin Maravilla, Bernabe Tiquiz, the brothers Ernesto and Armando Hernandez, Eustaquio Laluna, Nicolas Templo, Sesinando Lescano, Tomas Ariola, Abelardo Dimaano, father and son Elias and Simeon Gonzales, Quirino Manalo, Rigoberto Velasquez, Lizette Tibayan, Sonia Galicia, Crisenciano Villapando, Estanislao Tibayan and Ernesto Vergara. Meanwhile, Olegario Landicho was the town’s Justice of the Peace. He unfortunately passed away while still occupying the position. His place was quickly taken over by Vicente F. Landicho, a nephew of Olegario and brother of the late Mayor Florencio Landicho. Helping to keep the peace and order in Mataasnakahoy during this time was the police force under the leadership of, at one time or the other, Dalmacio Tibayan, Venancio Silva, Eliseo Recinto, Quirino Rodelas, Gelacio Ocampo, Sesinado Lescano, Teofilo V. Templo and Chief Francisco Olave. Those who held the position of District Supervisor of the Department of Education were Rosario Manguiat, Isidro Laygo, Francisco Mateo, Naty Kalaw, Maria P. Olea, Celestina Paran, Fidela D. Lobrin, Juanita A. Landicho, and Antonio Mercado. The principals of the barrio schools were Amor L. Magpantay, Joselito Silva, Pedro Inciong, Juan Silva, Nicanora T. Tibayan, Ana Capuno, Rosario Mendoza, Josephine S. Aguila and Quintin Magpantay, who rose all the way to the position of Division Supervisor. At La Purisima Academy, the Principals were Eden B. Recinto, Luz B. Silva, Charity T. Laqui and Mirasol Alvis. 2 “José Laurel Jr.,” Wikipedia.